If a person has a controlling interest (more than 50%) in 2 or more businesses, those businesses are grouped. 'Person' includes an individual, a set of persons, a corporation, all bodies and associations (corporate, incorporated and unincorporated), and partnerships. See the table to decide who has controlling interest for different business types. A person, or set of persons, who constitutes more than 50% of the management board, or controls the composition of the board. Different business types can be grouped if the same person or set of persons has a controlling interest. S Pty Ltd has more than a 50% interest in B Partnership. 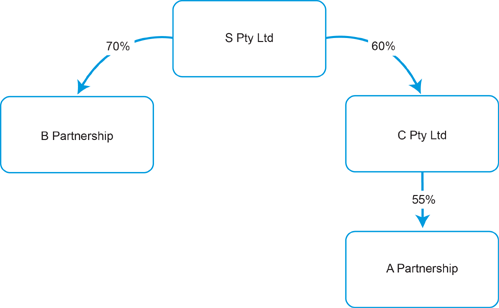 As C Pty Ltd is a subsidiary of S Pty Ltd, S Pty Ltd is also deemed to have a controlling interest of A Partnership. In this case, S Pty Ltd, C Pty Ltd, B Partnership and A Partnership are all grouped.